3.1.2. Vessels navigating in the Outer Fairway as described in (2.8) shall comply with Rule 9 of the Collision Regulations. 3.2.1. Every vessel navigating the Inner Harbour of Cowes or within 100 metres of the Mean High Water Mark shall unless otherwise authorised by the Harbour Master in writing, subject to the requirements of maintaining adequate steerage way and control, be navigated at a speed not exceeding 6 knots through the water. 3.2.2. Complying with the maximum permitted speed will not exonerate the Master of any vessel from the responsibility of reducing speed as necessary in the observance of normal practice of safe seamanship. This includes, but is not limited to, when passing mooring trots, pontoons, vessels alongside quays, jetties or pontoons, vessels engaged in maritime works and when approaching the Cowes Chain Ferry. Vessels shall at all times be navigated with care and caution and in such a manner so as not to endanger the safety of other persons or cause nuisance to the occupants of any other vessel, person or property. 3.3. Wash - A vessel shall not be navigated or manoeuvred in any part of the Inner Harbour or within 100 metres of the shore in a manner or at a speed so as to cause wash to be generated that may cause damage to or endanger the safety of other persons, vessels or property. v.	Support and rescue craft involved in the above activities. 3.5. Speed Exemptions - General Direction 3.2.1 and 3.2.2 shall not apply to any vessel on any occasion when it is being used by the Police, Fire Service or RNLI or other recognised rescue or patrol craft in an emergency situation, or for the purposes of enforcing these General Directions or any Special Directions. 3.6.2. No Master or owner of a vessel shall knowingly cause or permit any person to navigate or attempt to navigate the vessel in contravention with Direction 3.6.1. 3.7. 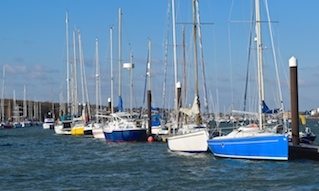 Departing Marina or Moorings - The Master of a vessel leaving a marina area or moorings within the Harbour shall give way to vessels navigating within a fairway. 3.8. Reporting Incident or Collision - The Master of any commercial vessel involved in any collision and any leisure vessel involved in a collision in which significant damage or personal injury is caused shall forthwith and certainly within 24 hours report the collision or incident to the Harbour Master and complete and return the Accident/Incident investigation report to the Harbour Master. 3.9. Sunk or Grounded Vessels - The Master of a vessel which has sunk or grounded in the Harbour shall immediately advise the Harbour Master of its position and any other particulars he may require for the safety of navigation. If a vessel under tow has sunk or grounded the Master of the towing vessel shall also have responsibility to advise the Harbour Master as aforesaid. 3.10. Vessels Abandoned or Adrift - The owner or Master of a vessel which has been abandoned or has gone adrift or is missing from her moorings in the Harbour shall notify the Harbour Master of the relevant facts (to include date, time and circumstances) as soon as practicable after the Master becomes aware of the event. 3.11. Unseaworthy vessel - No person shall cause a vessel in an unsafe or unseaworthy condition to navigate the Harbour except as necessary for that vessel’s safety and that of her crew, and she shall then proceed to such place as may be indicated by the Harbour Master. 3.12. "Competent Person” - The owner or persons operating or managing any vessel underway in the harbour shall ensure that the vessel is under the control or direct supervision of a competent person. 3.13. Due Care for Vessels Engaged in Work - The Master of a vessel shall navigate his vessel with due care and caution and at a speed and in such manner as not to cause injury to or endanger the lives of persons engaged in the laying or retrieving of moorings, navigational works, dredging works, salvage or construction works or underwater work. 3.14. Lights, impeding safe navigation - Except in the interests of safe and proper navigation no lights, including lasers or other beams shall be used in a manner which causes nuisance to or affects safe navigation. 3.15. Pyrotechnics - Except in instances of distress or safety of proper navigation, pyrotechnics shall not be used within the harbour without the permission of the Harbour Master in writing. 3.16. Yacht Race Management - Race Officers shall maintain a listening watch on VHF channel 69 prior to and during all yacht races starting and or finishing in the vicinity of the Cowes Fairway. 3.17. Navigation in Inner Harbour Small Craft Mooring Area - No person shall navigate any power driven vessel or sailing vessel fitted with an auxiliary engine within the Small Craft Mooring Area as designated on Admiralty Charts within the Inner Harbour south of the Detached Breakwater and west of longitude 01 17.50W, unless proceeding to or from a mooring located within that area, without the written permission of the Harbour Master. a)	It is reasonably considered by the Master to be the safest, most practicable route taking account of prevailing conditions of weather, tide and traffic. b)	That the vessel only uses the minimum number of sails required to maintain the vessel’s course and a safe and reasonable speed over the ground, whilst not exceeding the 6kt speed limit. c)	When joining the fairway / Small Craft Channel, due regard shall be had for the manoeuvring characteristics of other vessels, and in any case that Cowes General Direction 3.7 and the International Regulations for the Preventions of Collisions at Sea are complied with. 3.18. Restricted Visibility - ‘During periods of restricted visibility (defined as less than 2 cables) all vessels of 30m length overall and above shall not intentionally pass each other within the Inner Fairways of the harbour north of Medina Wharf, this includes overtaking’. Under The COWES HARBOUR REVISION ORDER 2012, PART 3 Harbour Regulation Section 12. Para 7a. RESTRICTED VISIBILITY (less than 0.2nm or 370.4m). Vessels 48 metres and above, LOA, should not navigate in the Inner Fairway or River Medina, if visibility is two cables (0.2nm or 370.4m) or less. 3.19. 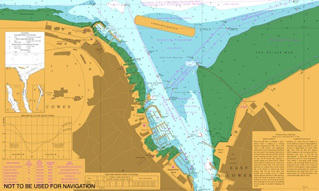 VHF Communications within Cowes Harbour - Except where such a requirement is suspended by the Commissioners in relation to a particular event or circumstance, all vessels of 20 metres length overall and above and all vessels engaged in towing are required to give notice of entry, movement affecting the fairway or departure within the area of jurisdiction of Cowes Harbour on VHF Channel 69. •	Prior to entering the Outer Harbour. 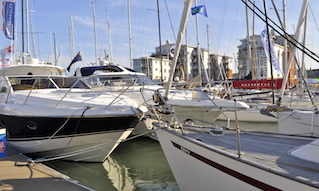 •	250m north of Cowes chain ferry (at Shepards Wharf Marina). •	Folly Inn (vessels bound for Newport). 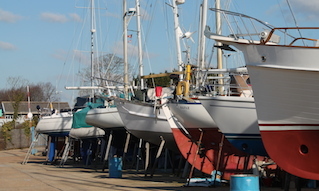 •	250m south of Cowes Chain Ferry (at Cowes Harbour Fuels). Any vessel to which this Direction applies and under way within the area of jurisdiction of Cowes Harbour shall, if a close quarters or passing situation is likely to occur, respond to an ALL SHIPS call from another vessel and state her name, position and whether inbound or outbound. In addition, vessels to which this Direction applies shall maintain a listening watch on VHF Ch 69 at all times when under way within Cowes Harbour area of jurisdiction. The ‘ALL SHIPS’ call as required by this Direction does not entitle any vessel priority or sole occupancy of the main fairway. 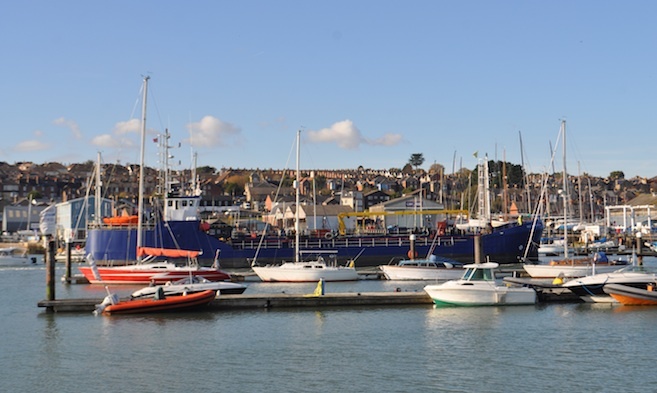 All vessels are required to navigate in Cowes Harbour in compliance with the Merchant Shipping (Distress Signals and Prevention of Collisions) Regulations (as amended) and Cowes Harbour General Directions. It is emphasised that this Direction applies to all vessels of 20 metres and above and all vessels engaged in towing, leaving Newport Harbour and entering the jurisdiction of Cowes Harbour. Nothing within this Direction shall relieve the Master of any vessel of over 20 metres in length of his obligation to give due notice to the Cowes Chain ferry by VHF radio call on Channel 69 as required under Section 6 of the 2014 Cowes General Directions (as amended).